1. Click on the Booking section in the left side menu. 3. Click on either the Invoice Number or the Open button to access specific invoice details. You can also access a (draft) invoice through a specific booking page. 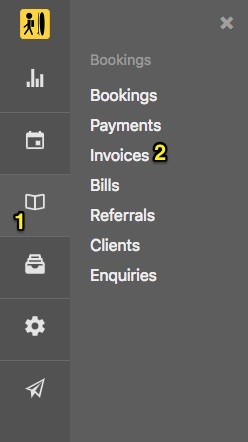 Enter the Bookings module > Bookings > Select Booking > Invoices > Select invoice. 5. 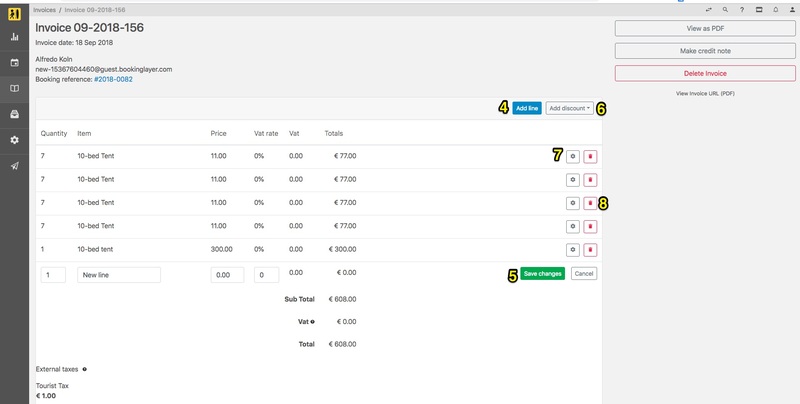 Add a title and price and hit Save Changes. You can also manually add a Discount to an invoice, if you have previously set Discounts in your Backoffice. More information on Discounts can be found in this article. 6. Click on Add discount and select the applicable Discount. Please note that if you decide to change the price of an existing room, activity, or item in your Backoffice, all of the invoices that had been generated for those items prior to the change, will remain set at the original pricing.